Wowsers! 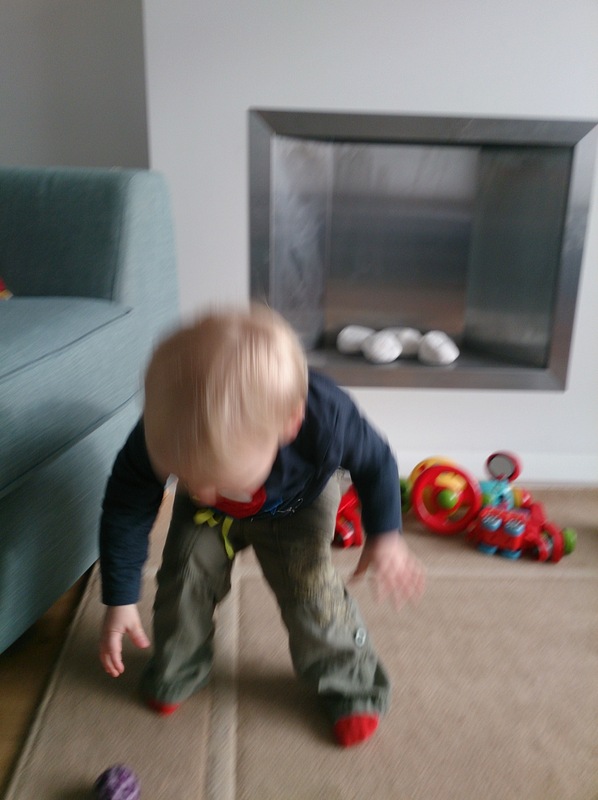 18 months old, I know we all say this but I don’t know how that is possible! Sprog has been far from a baby for what feels like a long time now but he is most definitely a little boy now and becoming his own person very quickly. I’ve never done an update like this on him before but it seems like such a big turning point between baby time and the future. 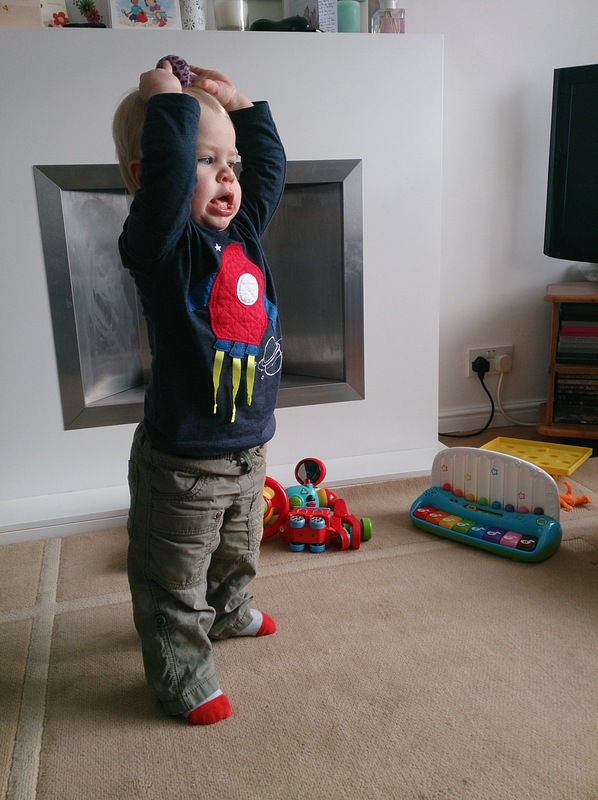 Sprog loves dancing! 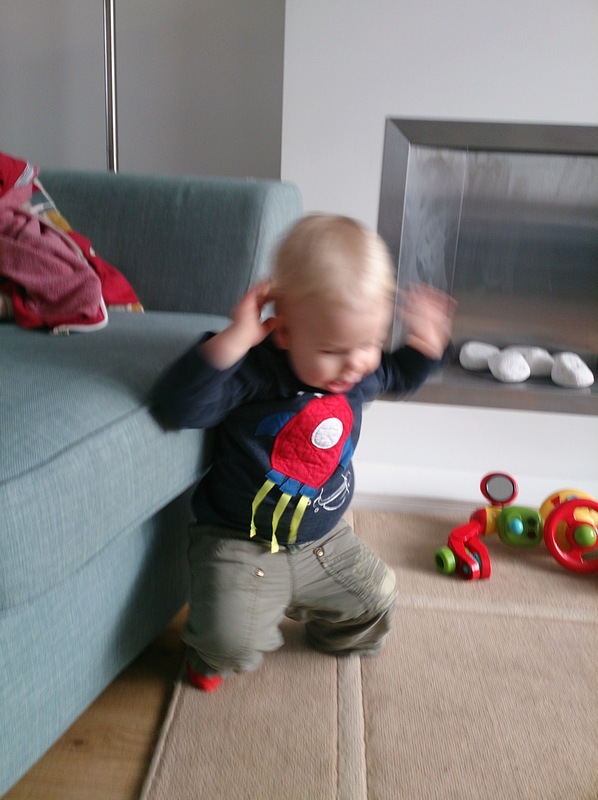 A few of my favourite moves include the spinning clap and the wobbly knees (where he starts bouncing up and down and then seems to lose control of his knees). The latter is certain to render me useless in fits of giggles every time as he looks so serious whilst he’s doing it. He is drawing now. I find this very exciting. We’ve crossed the line from banging the table with a crayon in hand which creates dots on the page and are firmly into holding the crayon and making deliberate lines on the page. These are normally very straight and go up and down the page repetitively. Repetitive is a word that I would use to summarise Sprog’s actions at the moment. He’s always doing the same thing over and over again. Whether it be stacking and unstacking cups, sorting his shapes into the box, reading books, or his current fav, buckling and unbuckling the clips on his highchair or booster seat. He is watching Chuggington with much glee and excitement. He doesn’t watch much tv at all so when we suggest this as an option, he gets super excited. Bath time play includes a lot of splashing, pouring water on his head, finding his toes and washing his own tummy and then Daddy’s face! “Hello” and “Bye” accompanied by a lovely little wave. “Bye” is often used after the person has disappeared from view! “One more”/ “No more” – these are both very close to recognisable by everyone else but at the moment just to us! “P” for “please”, the last few days this has started to have more of an “lll” sound on the end. 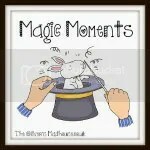 “Uh oh” – the most commonly used phrase in our house at the moment! Sometimes it gets replaced by “oh dear” but this is a rare occurrence. 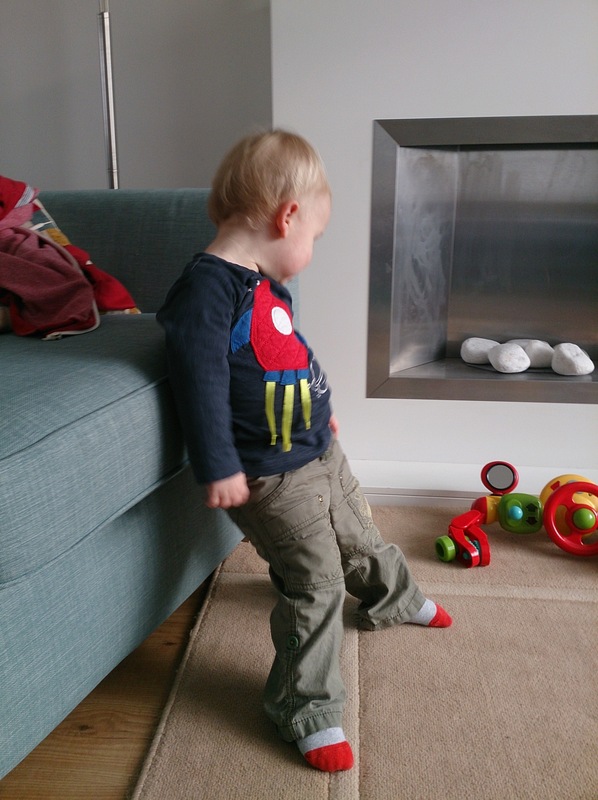 So this is less straight forward than it would have been at 12 months. 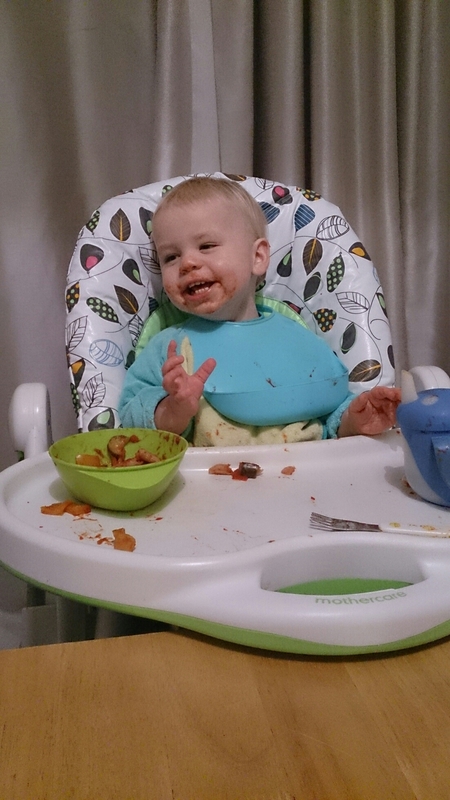 We did baby led weaning and I still believe it to be utterly brilliant but over the last couple of months, Sprog has become less tolerant of some foods. I think a lot of this has been down to various bugs (tonsillitis, chicken pox) and some epic teething. He has a good bank of stuff that he will eat without fail – Pasta, noodles, cheese, yogurts and all kinds of fruit. Toast is usually a winner too. Then there the foods that he occasionally loves. When he feels like it, he’ll scoff these; when he doesn’t, they get spat back out. They include eggs, mince, pitta bread, carrots and cereal. Pretty much any book he can get his hands on. He still loves the Baby Owl books by Jonathan Allen – ‘I’m not scared’ is always a favourite, especially when it’s just Mama doing bed time and I have to do the bear voice instead of Daddy. 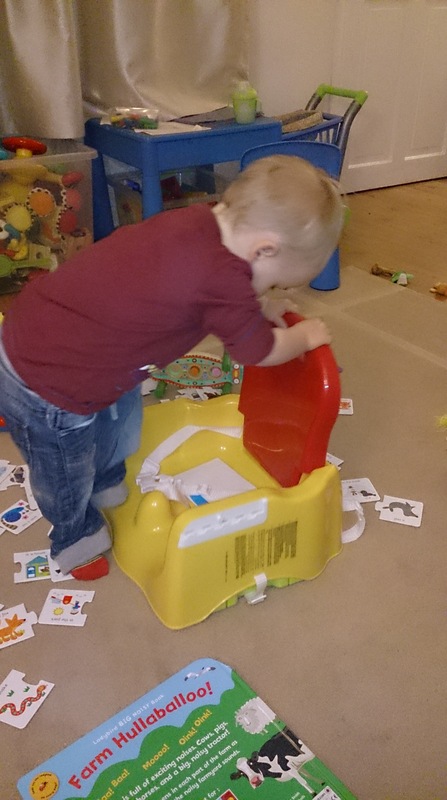 He’s having an obsession with flap lifting and noise making books – we have a farm one that I too enjoy, and a Thomas one which I feel like throwing out of the window! Sprog is still such a good sleeper. Sorry. I feel like I always have to apologise as I know so many small people don’t like to sleep as much as he does. He sleeps from 7.30 p.m. until 6.30-7.00 a.m. He will either have 2 1 hour naps during the day (a.m. and p.m.) or if we need to for timings that day, a larger nap midday. He mostly sleeps his way through illness. 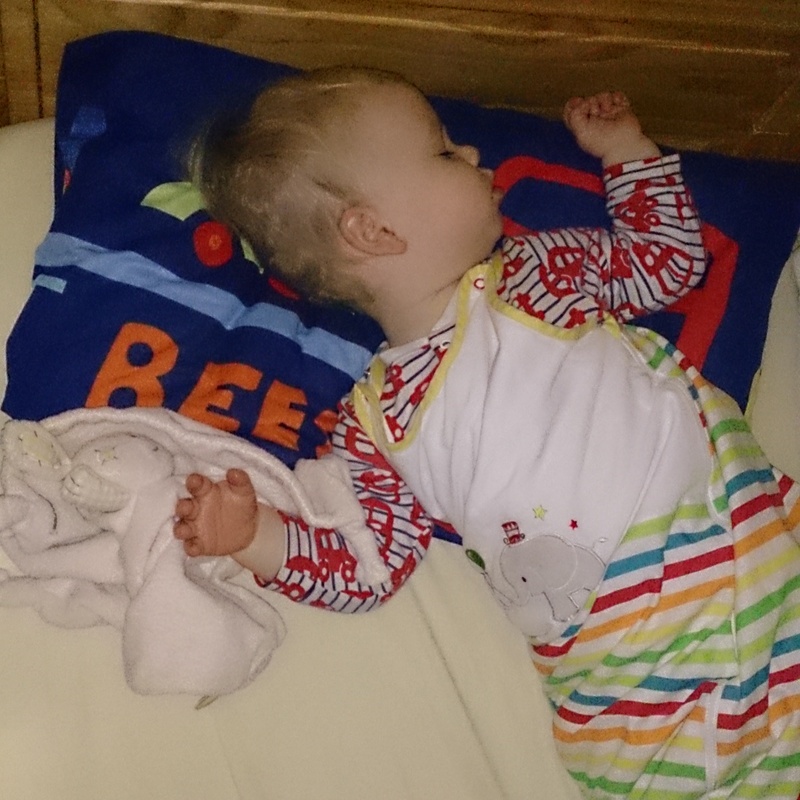 Whilst he has chicken pox at the moment, he is sleeping soundly and we are waking him up in the morning. Last week though, the cough that preceded the pox had us all up a couple of times a night for a few nights straight and that was a shock to our systems. I have no idea really how much sleep he should be having now, I just know that he is happy and content at the moment. In my head I have this vague idea that he should be dropping naps by the time he is around 2 but I’m not really sure where this has come from so I’d be really interested to hear what your little ones do with nap time. What these lists don’t get across to you is just what a happy, smiley and delightful little man my Sprog is. He has a great big beaming smile (inheriting my big mouth!) and a giggle that makes me laugh so hard. 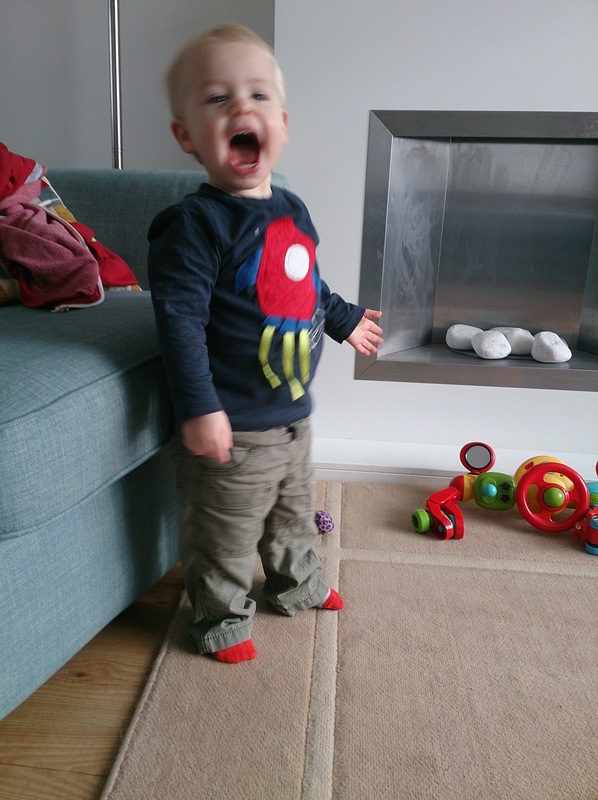 The giggle is definitely less baby and more small person now as he totally belly laughs and can’t stop grinning at the same time. 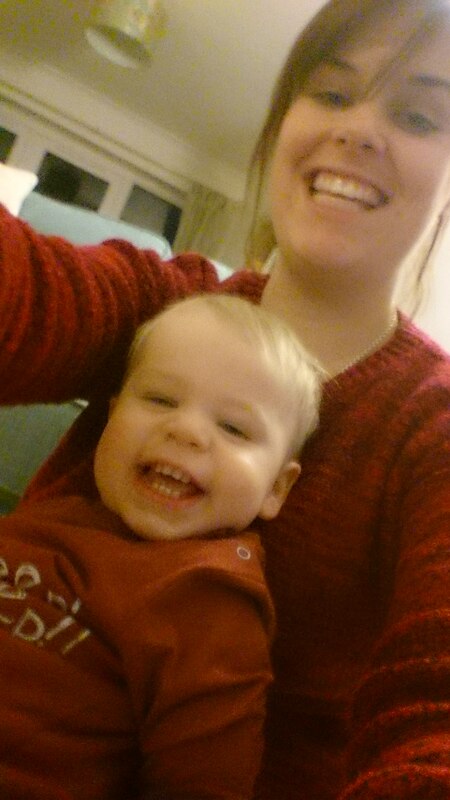 He truly makes every day with him an absolute pleasure (apart from the tantrum filled ones) and whilst I have never been more tired, I have also never been so happy! I just can’t wait to see what the next few months hold for him! Playing with a cat ball! No joke…we spend money and time hunting down the nicest toys for our children’s development and enjoyment, don’t we? So why, do they insist on being far more interested in the cat’s play balls which are probably 4 years old and totally manky! Yesterday, he spent 30 minutes playing with a key and lock at a friends house. Today, 20 minutes picking the cat ball up, holding it over his head, counting to three (‘t’, ‘t’, ‘t’) and dropping it backwards which was literally the most hilarious thing in the world for a solid 20 minutes. O so very happy with himself! 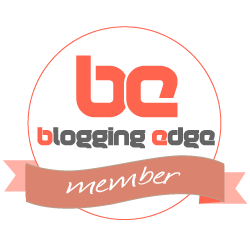 If you like what you’ve been seeing and reading, then why not head over and follow me on bloglovin’ – just click this handy button! 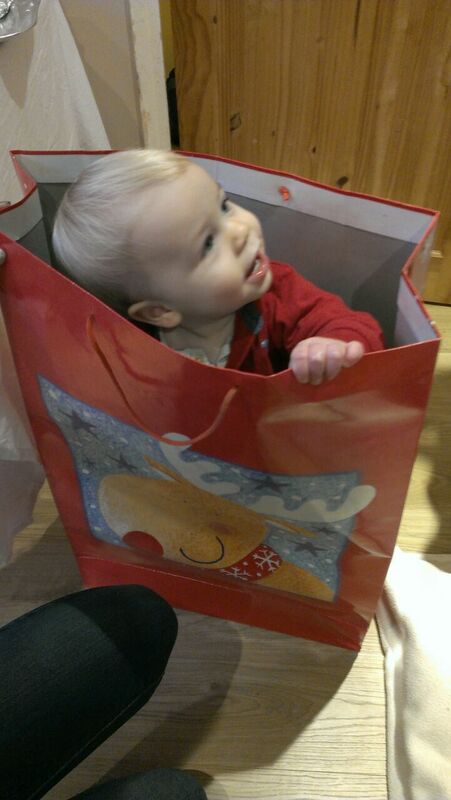 No Sprog’s were harmed in the creation of this photo. Although 3 of my friends had a great time! Linking up to Wicked Wednesday! Older or Younger? A game for Mama! Let me introduce you to my man, Sprog, and whilst he is my little man, it would appear that in fact, very little about him is actually little at all. 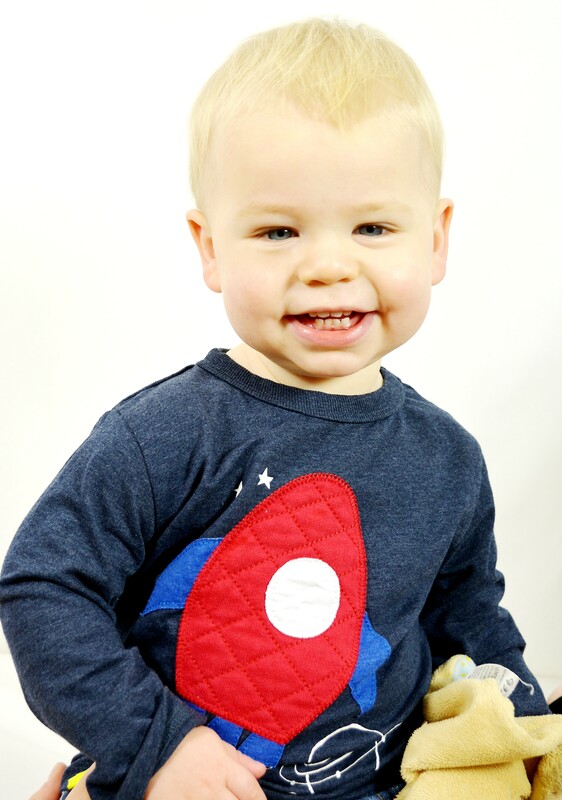 He is 17 months old (born August 2013) and a delightfully happy chap. When he was little was out of his Moses basket and into the cot at just 2 weeks old as he was too long for it. Over the last few days and weeks, we’ve noticed a big change in his physical development. 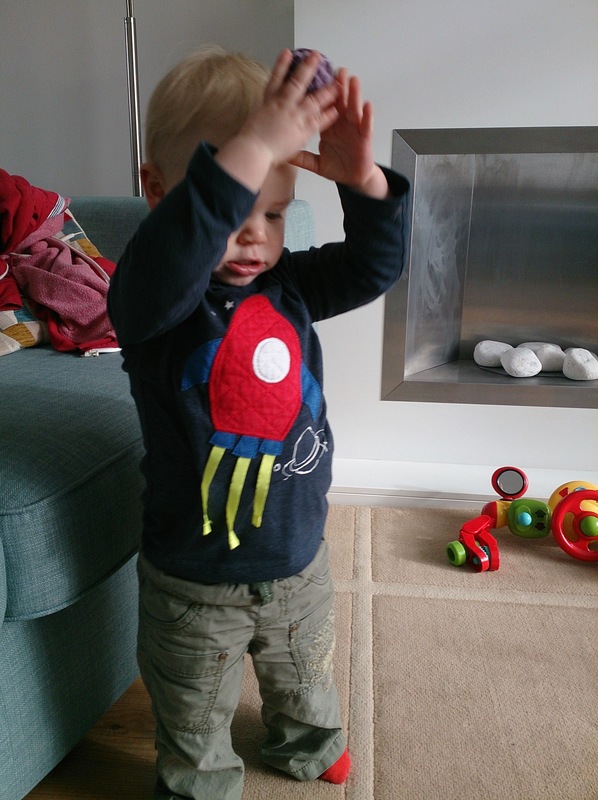 For example, he seems to have outgrown what are known as ‘baby arms’ in our house (you know when their arms don’t stretch above their heads) and can now reach high enough to put something on his head, in this case a party hat! He’s started to look like he needs a bit more space/length in some of his t-shirts so I’ve started to route out the 18-24 month clothes 😦 As I’m doing this, it makes me sad, and makes me understand a little bit more why people start trying for another baby around this time (please don’t get excited … No.2 will not happen for a while). He got a lovely jacket for Christmas which is 18-24 months and whilst we do have to roll the sleeves up once, it fits perfectly elsewhere. If I’m honest, we actually had trouble doing it up the other night after dinner as his tum was too round for it. But at the moment I’m a little troubled by the lack of guidance on the developmental milestone after the first 12 months and before they start school. There seems to be a great big void in the advice that we then get. We get hounded by lovely Health Visitors for the first 12 months as we dutifully take them to get weighed every now and then to satisfy our need to know that we are keeping this beautiful child alive and healthy! Then nothing. Having had a quick glance at the options in my local (and therefore admittedly, small) WHSmith’s this evening, there are all the crisp and clean looking versions of the slightly mangled ones we possess about the first year and then books about how to control your toddler – not about how to challenge them… anyway, I digress, perhaps I need to investigate this further for another post. 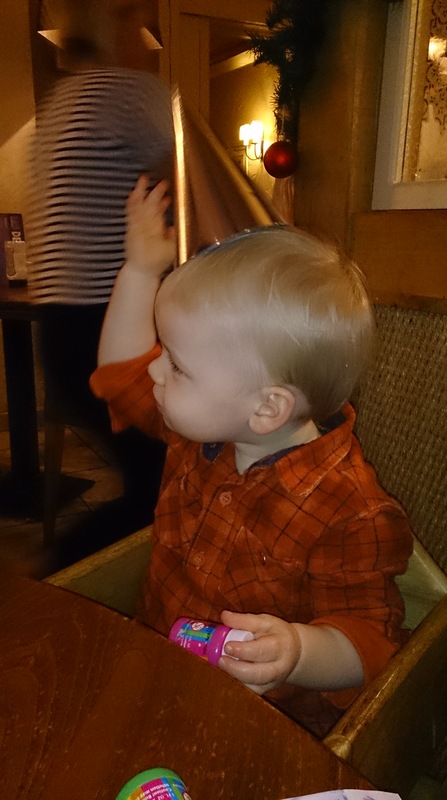 So, baring in mind that I literally know nothing about what a 17 month old should theoretically be doing and understanding I discovered myself playing a fun new game today when we were in town – Older or younger?! The rules are very simple… without asking any exploratory questions, guess whether the child you spot is older or younger than your child! I had 2 examples were I could not guess… I’m too scared to ask the parents so I shall forever be wondering! This boy was quite a distance from us in the M&S café (nice little lunch time treat to ourselves! ), but he appeared to be taller than Sprog which automatically made me think older. And then I spotted something which made me question everything… he was eating baby food from a jar still! Now just because I don’t know anyone still doing this at Sprog’s age doesn’t mean that it doesn’t happen but I was now super confused. So we decided probably younger. Honestly, this ended up being a game that I played, mentally all the way around town as we shopped. I was never judgemental about how parents were getting on but it made it abundantly clear to me that past 12 months, I really don’t feel like we get much support. If you try out my game, let me know how you get on. I found it much more difficult than I thought I would. It did spur us on the try and measure how tall he is and we got somewhere between 86 and 88 cm which means our beasty boy is 95th to 99th percentile for length on the little chart! I’ve just read an article that claims that around half of parents regret their choice of names for their children at some point. Having read some of the examples they found, I can’t say that I blame them but then I would never have chosen those names in the first place. There’s the twins who were just given letters as names, there’s those named after famous sporting hero’s, and as a teacher, I’ve often come across some where you wonder what the thought process was. Admittedly, one of the reasons sounded a little familiar. Some parents chose names for their unique nature and later found out that it had proved a popular choice with other parents that year too. A couple of months after sprog arrived, I was again looking at pointless articles online (possibly during a nightfeed) and came across the top 100 names of the year… I was horrified to see his name in at number 62! We thought we’d chosen a really unique name. 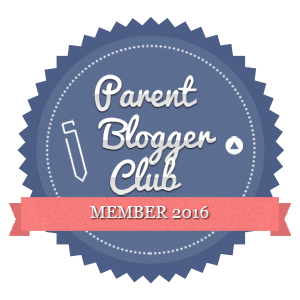 Later, at our early Parenting group, we then met another mama and sprog combo with the same names as us! I cannot explain how shocked we were (needless to say they were great people so our names must be indicators of amazing people!). Despite these things, I honestly have no regrets about the name we chose. I love it. 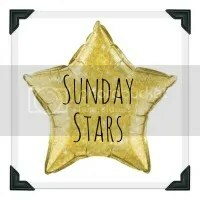 He is my little star. He is my light and my happiness. And he and his name are perfect. And I’m not sure that I can understand how you might think that your little ones name isn’t perfect but nevermind.